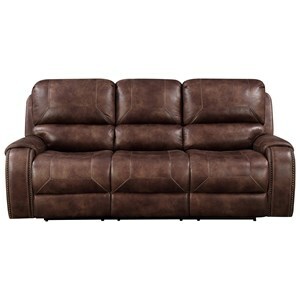 Create a contemporary casual appearance in your home with this reclining sofa. Generously padded arms, wings, seats, and backs as well as individually wrapped, drop-in pocketed coils that prevents sagging. In addition, soft fabric cover is durable and easy to clean and a stylish frame and handsome tufted detailing on the backs are also included. There's lots to like with this reclining sofa. 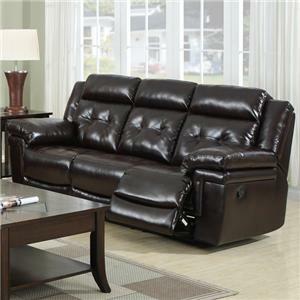 Give you and your family a comfortable and functional spot to relax with this power reclining sofa. The powered recline mechanism makes it extremely easy to find your preferred position, while the built-in USB ports allow you to charge your devices without having to get up. This particular piece is draped in a luxurious Waylon Mocha fabric, but it is also available in Steamboat Chocolate or El Paso Brown. 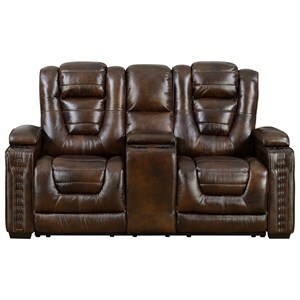 With its comfort, function, and style, you'll love having this power reclining loveseat in your home. The piece boasts plenty of useful features, including powered headrests, cup holders on each arm, and a hidden middle storage console. Additionally, the power recline mechanism makes it extremely easy to achieve your preferred position. Finally, unique tufting and nail head trim add a casual sophistication you'll love having in your living space. Enjoy Sundays in front of the TV with this stylish and smart power recliner. The power recline function lets you kick back at the touch of a button, which includes a USB port so that you can keep your phone or other electronic devices within reach while they charge. Pillow arms and a pad-over-chaise seat promise comfort from head to toe, while clean lines add modern appeal. 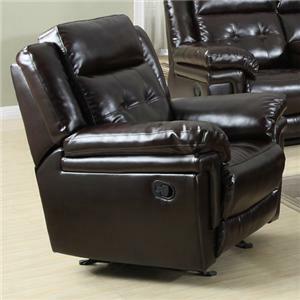 With its comfort, function, and style, you'll love having this power recliner in your home. The piece boasts plenty of useful features, including cup holders on each arm. 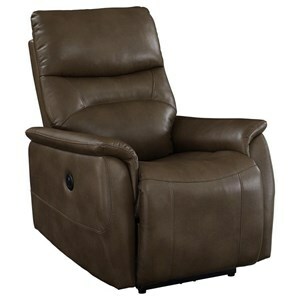 Additionally, the power recline mechanism makes it extremely easy to achieve your preferred position. Finally, unique tufting and nail head trim add a casual sophistication you'll love having in your living space. 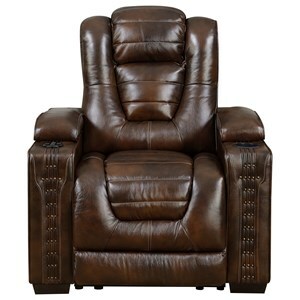 With its comfort, function, and style, you'll love having this power recliner in your home. The piece boasts plenty of useful features, including powered headrests, a cup holder, and hidden storage compartment perfect for remotes. 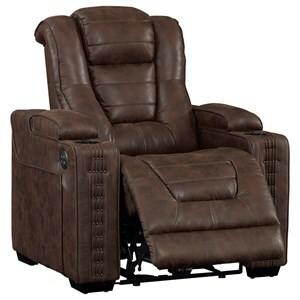 Additionally, the power recline mechanism makes it extremely easy to achieve your preferred position. Finally, unique tufting and nail head trim add a casual sophistication you'll love having in your living space. Usher comfort and contemporary style with this recliner. Generously padded arms, wings, seats, and backs as well as individually wrapped, drop-in pocketed coils that prevents sagging. In addition, soft fabric cover is durable and easy to clean and a stylish frame and handsome tufted detailing on the backs are also included. There's lots to like with this reclining glider. Prime Resources International designs, sources and markets a wide variety of motion upholstery. 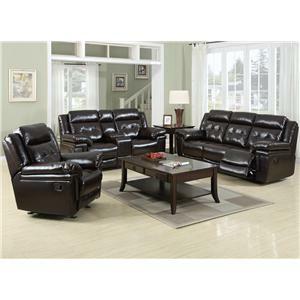 Collections are focused in 4 categories: Reclining Chairs, Reclining Sofas & Love Seats, Reclining Sectionals, and Home Theater. PRI is known for supreme comfort, consistent quality, reliable delivery and superb value at entry and middle pricepoints. Prime Resources is a strategic marketing unit of Home Meridian International. HMI is a next-generation global design, sourcing and marketing company that ranks among the top 5 casegoods suppliers to US furniture retailers. Privately held, it is headquartered in High Point, NC and operates distribution centers on both coasts.